While I was in Singapore, I was given a set of White Nights watercolours to try. They are available through the Straits Art store and a sample was provided to the #USKSingapore2015 symposium instructors to sample. 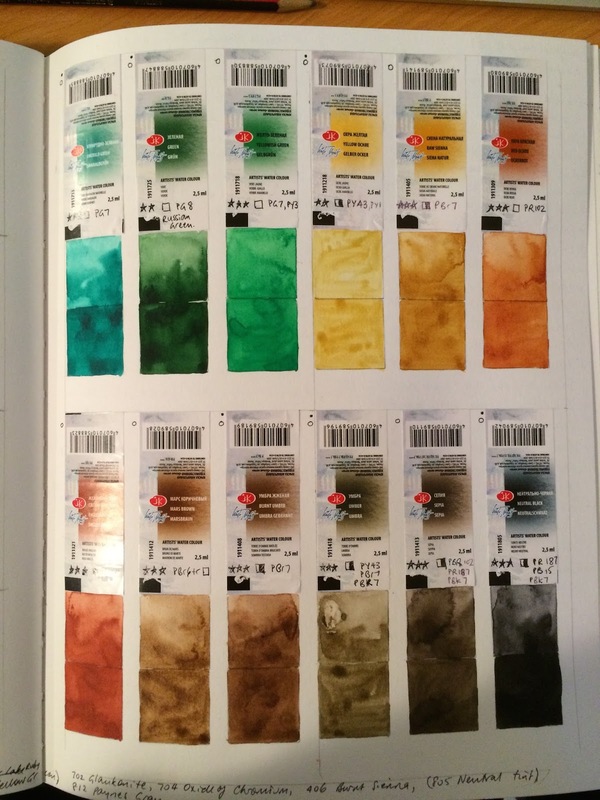 These watercolours are available in full pans or tubes and come from Russia. There is a full range of 55 colours, many of them single pigment colours, though some are a mixture. I'd heard that they were an economical range that rewet well and found that to be the case with most of the colours I tried in this 24-colour set. The full pans were only S$3 or S$4 each in Singapore, which is excellent value. This case could easily hold an extra 12 colours but 36 is a lot! They are also available in 48 colour sets and the 12 colour set looks to have quite a good looking compact case. The labels give the pigment information, lightfast ratings and opacity. Some of the pigments are very fugitive so would be best avoided for work to be framed though would, I suppose, be protected from light in a sketchbook. All the same, I'd avoid the colours with only one * rating and be cautious about two ** ratings. The *** rated colours have reliable pigments though I don't know how much filler. There is a very workable warm and cool yellow, red and blue and some interesting earths though some of the earths were weaker than I would have expected, and this set didn't contain Burnt Sienna, one of my key colours. 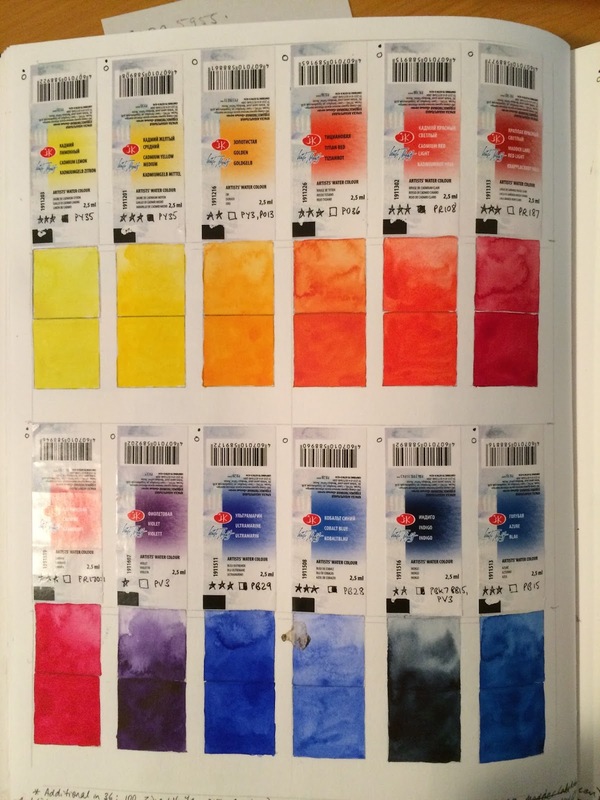 I plan to paint them out in swatches in more detail at some stage and test them in mixes but my first reaction is that these could be a very good option for those getting started in watercolour and looking for a starter set of 12 colours that are better than the student ranges currently available, such as Cotman. If you are starting out in watercolour you may not want to buy whole tubes but affordable full pans are a good option. I'll add to this post later. I have written the pigment numbers a little larger on the labels so click on the photos to see in more detail. 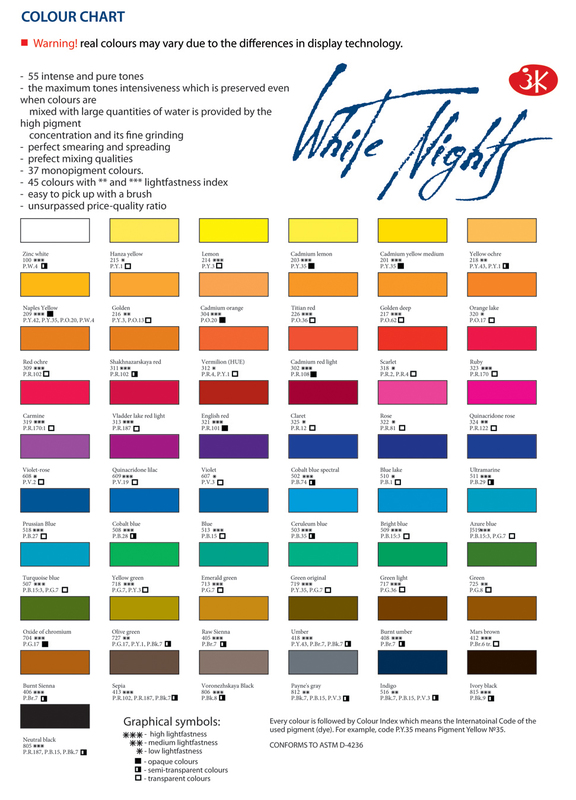 Suggested 12-colour White Nights mixing set. I was asked in the comments section below (August 2016) what a good White Nights 12-colour beginner palette might be. I was able to test Cerulean and burnt Sienna while in Bath UK - the burnt sienna is a nice version and definitely worth including. Cerulean is rather weak but still a useful colour to mix with ultramarine for skies. So - here's my general 12-colour suggestion. You can see the warm and cool yellows. I don't generally recommend the cadmium colours for sketching but these are not particularly opaque so won't cover the lines the way many might. Golden is not especially lightfast, but would be fine in a sketchbook. You can see three reds, which is my preference as the Madder Red Light will mix interesting colours with the phthalo green, but you may only want two reds in which case the Cad Red Light and Carmine would do the trick. There are the three blues - a warm Ultramarine, a cool phthalo blue (Azure) and the liftable Cerulean. Emerald green is the same as phthalo green (PG7) and a great mixing colour best not used alone. The earth colours - Raw sienna and Burnt sienna - are rather nice. Sepia is an option, or a mixed grey though I haven't tested those and usually try to keep away from black pigments. If not including Madder red light, both sepia and a mixed grey could be included. In 2015 I sent a list of 12 colours that would be suitable as an urban sketching palette to White Nights Russia, and it included Cadmium Yellow Medium, Golden, Cadmium Red Light, Carmine, Ultramarine, Cerulean, Emerald Green, Green, Raw Sienna, Burnt Sienna, Sepia and Payne's Grey. This set is now (November 2017) available from Larry Post Australia, called the Plein Air set for AU$49.95. I'll add a paintout of this set to a future post, along with the full range of White Nights colours. The White Nights 12-colour palette is a decent size for sketching. The large pans are great for brush access. I still prefer the stronger tinting power and lightfast ratings of the watercolours I have been using for over 20 years, but as a starter set the price is hard to beat so you may well like to give them a try. White Nights Burnt Sienna and Ultramarine mixes. The burnt sienna is actually more orange than it looks on my screen - it's a nice colour, though on the yellow side, and a good mixing pair with the ultramarine. Quite different, though from the DS Burnt Sienna that I usually use, which is more on the brown/red-side of burnt orange. I think they are an excellent value starting set for sketching - better than Cotman and other student sets. In fact I think the set of 12 is a great - large pans and a portable travel palette - though I'd change some of the colours in the set. I have since tried the burnt sienna and it is a nice version. I'll update the post and add burnt sienna and cerulean to the swatches. Which 12 colours would you recommend as a good starter set? I've added a paintout so you can see the colours. Hi, very nice blog and I found your article very informative. I am a fan of Schmincke watercolors but wondering if white nights are of the same quality? 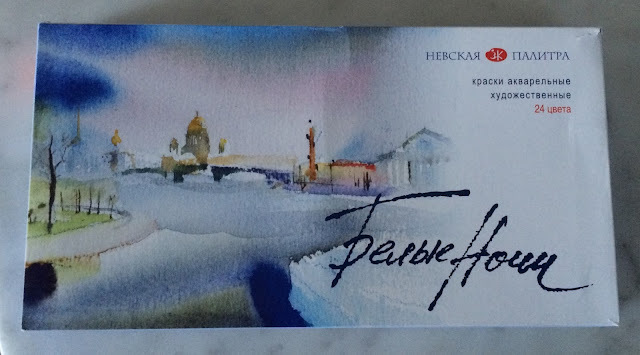 White Nights are good value and affordable, but I don't think they have the pigment strength or permanence of the Schmincke watercolours. Very helpful review thank you. Very helpful, thank you. One remaining question regarding lightfastness ratings:for Mijello Mission Gold the ratings go from ***** to *. Do you know whether a *** on their scale would be the same as a *** from White Nights? Meaning is this some standardized scale? It's risky to make assumptions, so best to check their websites. Some give a detailed scale - for example a I rating may represent 7.5 to 8 on the blue wool scale, or it might represent tested to 125 years, but some are more reliable scales than others. I did my own lightfast tests on the colours I decided to use! M. Graham Gouache - painted out. San Francisco and Seattle here I come!